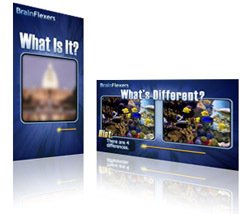 Brain Flexers is a collection of visual games designed for use in digital signage applications. Our professionally produced animated games will be an eye-catching and entertaining addition to any play list. Increase the "visibility" of your digital signage with Brain Flexers. Eye-catching, entertaining visual games designed for digital signage networks. Choose from a variety of games to add excitement to your play list. Brain Flexers is a collection of professionally produced video clips, available in both horizontal and vertical formats. Brain Flexers are available to suit your specific digital signage network needs and are available in the following game styles. What's Different? - Screen animates to display two very similar images. As the timer elapses several hints appear to help locate the differences between the images. Once the time has passed, the answers are displayed. CLICK HERE to view "What's Different?" and get more info. Word Find - Screen animates to display a grid of letters and a list of words. After the timer elapses the words are circled showing you the answers. CLICK HERE to view "Word Find" and get more info. Where on Earth? - Screen animates to display a NASA satellite image. As the timer elapses several hints appear to help to figure out what the place is. Once the time has passed the answer is revealed. CLICK HERE to view "Where On Earth?" and get more info. What is it? - Screen animates to display an obscured image. As the timer elapses the image becomes clearer until finally it is revealed and the answer is displayed. CLICK HERE to view "What is It?" and get more info. Brain Flexers design elements can be customized to compliment your branding or architecture. The game content can also be customized to promote the subject matter of your choice.